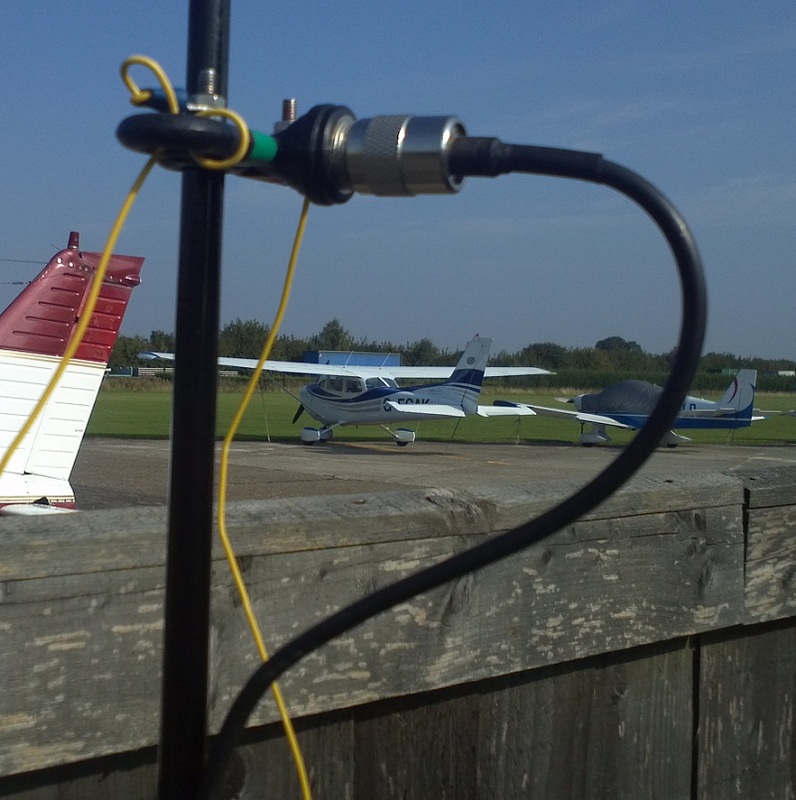 For my /P outings, I make use of a 10m telescopic fishing-pole purchased from SOTAbeams which is able to support a variety of aerial configurations – My preferred being a coax-fed 40m Inverted-V or via 300-ohm balanced feeder as a low-loss frequency-agile Doublet. When using coax, I had previously made use of a fairly chunky emporium-bought dipole centre which has a built-in SO239 connector. It’s a sturdy item, and although perfect for home use, does mean that a PL259 has to mate with it making the whole ensemble at the end of the pole a little whippy at times. As you can see from the picture, the strain-relief on the PL259/RG58 contributes to the sway-factor. In order to lighten the load at the top-end of the pole, and to keep the coax pressed against it – I decided to make-up a new run of RG58 coax and use one of my Ham Goodies dipole centres. There’s already one at the end of my 300-ohm feeder so putting one onto a run of RG58 was long-overdue. 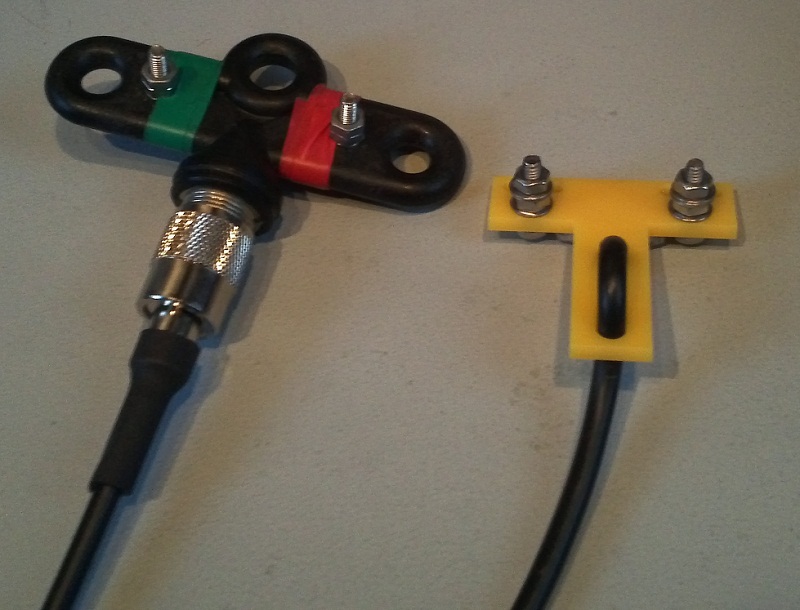 The yellow T-piece is perfect as part of any /P kit – it means that I can save money on connectors and there’s less chance of a connector failing during assembly/tear-down. So that’s boxes ticked for efficiency and value-for-money – true Ham spirit! The picture below shows a comparison of store-bought and home laser-cut solutions. Excluding the coax, the weights of each are 55-grams and 13-grams respectively – this 42-gram reduction by using a smaller centre-piece and omitting an SO239/PL259 combo is a considerable reduction and I’m sure the pole will be happier for it. Here’s the completed arrangement fixed to the 2nd section of my pole. 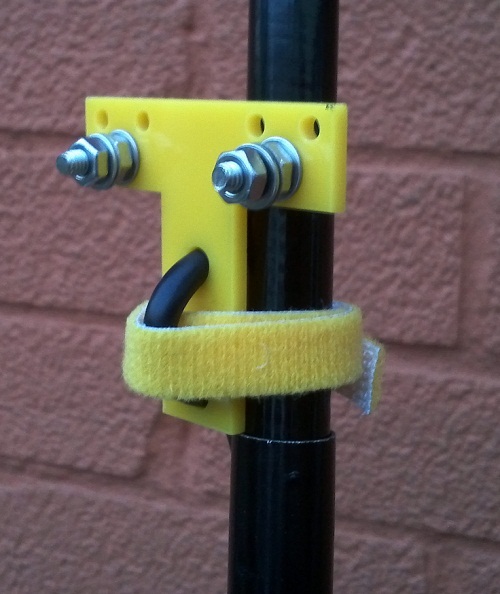 I looped a short piece of velcro strip through the RG58 and then around the pole: Do this about half-way up the section, then slide it down to the joining point – the velcro will be a tighter fit due to the increased diameter of the pole. With everything fixed against the pole and no bulky PL259/SO239 connections it shouldn’t worry me when operating if it gets a tad breezy. One final thing I’ve done recently: I added a piece of brightly-coloured electrical tape at the 9m mark from the feedpoint on my RG58 and 300-ohm runs – this gives me an easy method of ascertaining – before the pole goes up – just how far away I can be from the base of the pole.